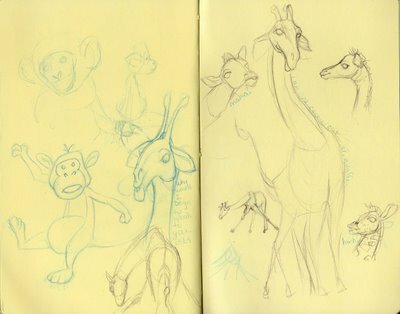 I've been killing three birds with one stone with these animal drawings: 1. practice drawing animals, 2. create some fun (and simple) animals for my friend's daughter's room, 3. do some character studies for my Traditional Animation Basics 2 class. In the TAB2 class, we're going to be using the 12 weeks to create a 30-second animated PSA! How cool is that? Since I never animated before the TAB1 class, I'm kind of nervous, but I'm going to jump right in and give it a go. If nothing else, I feel that I'm really good at brainstorming, researching and coming up with ideas/unique perspectives. 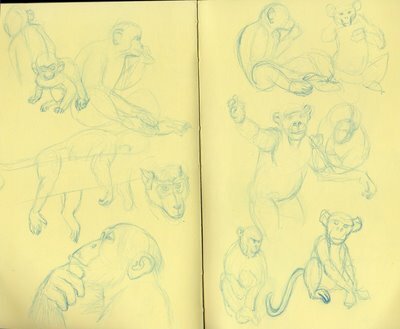 All the realistic-looking sketches are from photos off the internet, but the cartoon-y ones are my original creations. 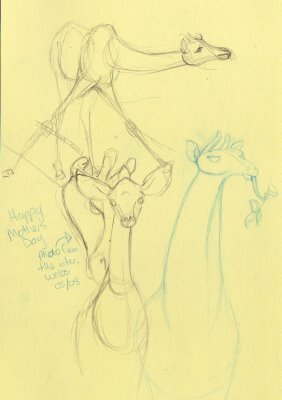 Besides for the 3 crazy giraffes, my favorite one is the mom and baby giraffe. Incredible original photo here. I may have played up the size of the baby's ears a bit much, but they make him just too cute!